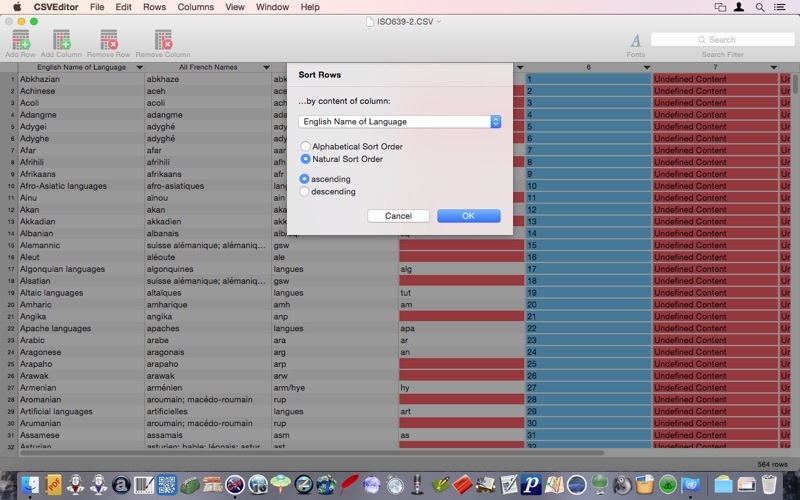 CSVEditor is the new Mac OS X tool which makes creating and editing CSV data more comfortable. 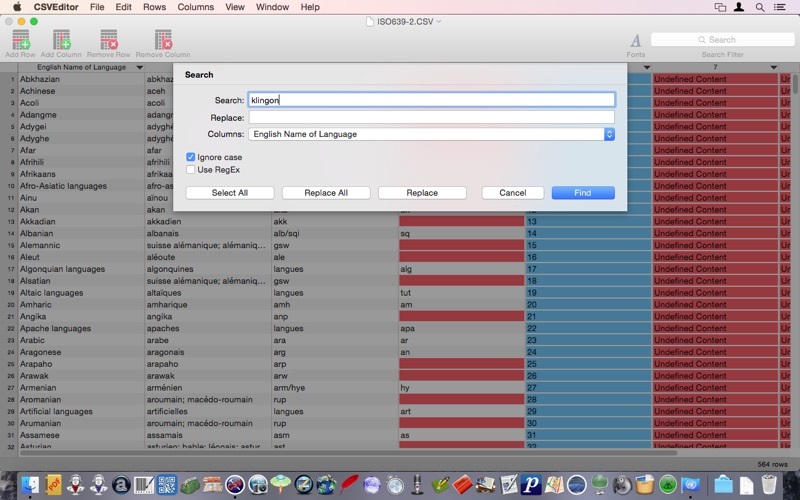 You can create new spreadsheets or open any CSV file in any available encoding. Add, remove or move rows and columns. Add, remove and edit contents manually in the cell editor or automatically with the Fill editor. • The application now is a 64 bit application. • The icon has been slightly changed and optimized for Retina displays. 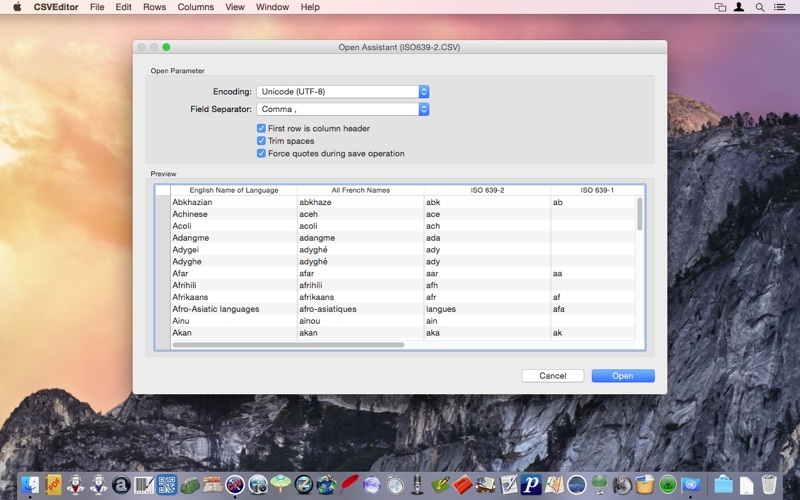 •  In the Preferences, you can define a default font. When a CSV table has been opened, you can change its font via the font system palette. 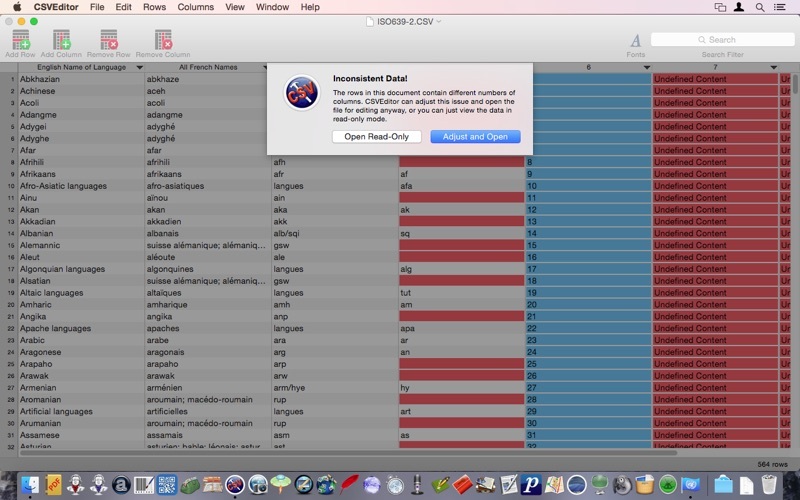 • In the Preferences, you can define and edit rules for coloring the data cells. The rules can be simple text comparisons or regular expressions. • File menu: new menu item "New From Pasteboard": Creates a new table from the current content of the pasteboard (rows, columns, or tab-separated strings). • Edit menu: new menu item "Deselect All". •  Rows can be treated with standard copy functions (Cut, Copy, Paste). Rows will be placed on the pasteboard in a proprietary format for the app as well as in tab-separated strings. So they can be merged into another CSVEditor document later, in Numbers or any other text editor. On insert, selected rows will be replaced, or rows will be added to the end of the document. 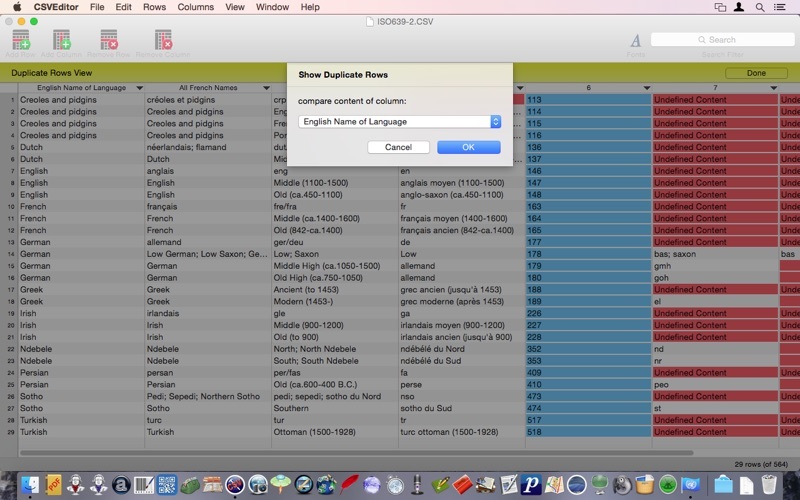 •  Rows menu: new menu item "Show Duplicate Rows". Shows duplicate rows or rows with same content in a defined column. While in Show Duplicate Rows mode, editing of the document is restricted: Rows can be changed and deleted, but columns cannot be added or changed. A click on the [Done] button quits this view mode. •  Rows menu: new menu item "Remove Duplicate Rows": Deletes identical rows or rows with same content in a defined column. • Rows menu: new menu items "Shift Content to…", and "Rotate Content to…": Use these functions to move or rotate contents of selected rows. • Rows can also be sorted by mouse (drag and drop). •  When you delete rows or columns, you can suppress further security alerts. In the Preferences, you can reactivate suppressed warnings. •  Columns menu: new menu item "Merge Selected Columns": Columns now can be merged; you have to define the order of columns to be merged, and the target column. The source columns can be deleted optionally. • Fill Columns: When you auto-fill columns with numeric values, you can now add a space separator (only for prefix and suffix options). •  In the context menu for columns, you can adjust the width of a column. •   Columns menu: new menu item "Adjust All Columns Widths": The widths of all columns will be adjusted automatically. •  When you save a document, you can force quotation of data fields. You can even assign this when you open a document. • Via the Columns menu and the Columns context menu, you can define the alignment of column contents. •  Columns menu: new menu item "Insert Columns". • Also columns can be treated with standard copy functions (Cut, Copy, Paste). The columns content will be placed on the pasteboard in a proprietary format for the app as well as in tab-separated strings.